(SANTA BARBARA, Calif.) —May 23, 2018 – Local businesses have the unique opportunity to make a difference in the lives of children and youth in foster care, by providing Resource Families (formerly known as Foster Homes) opportunities for discounted goods and services, and by providing opportunities for youth in foster care to develop vital skills that will help them become successful members of our community. In order to boost the roster of participating businesses, Our County. Our Kids. a program of the Santa Barbara County Department of Social Services, is spearheading a County-Wide Fan-Out, an outreach event taking place on Saturday, June 23rd from 9-12 PM. Businesses are invited to join the Inspire program by partnering with Our County. Our Kids. to provide discounts on goods and services to resource families who are caring for children and youth in foster care. Other ways businesses can help include: connecting with area non-profits to host fundraisers, donating funds or programs supplies, serving as donation collection points, distributing Our County. Our Kids. outreach materials, and helping to promote upcoming information sessions to recruit more supportive Resource Families for Santa Barbara County foster children and youth. Michaels in Santa Maria was one of the first to join the Inspire program and will be providing Resource Families and foster youth with 15% discounts to support their creative endeavors. Additionally, they will join Our County. Our Kids. at community events to raise awareness and distribute coupons. Monighetti’s One Stop Livestock Supplies, Inc. in Buellton has also signed on as an Inspire partner. Interested organizations are also encouraged to provide work experience opportunities or internships to older foster youth who are preparing to enter adulthood. As many foster youth approach this crucial transitional period, many are still searching for a career path or passion to pursue and benefit significantly from the guidance and mentorship of leaders in the business community. Participating businesses and organizations are offered a variety of benefits to build their business exposure and increase awareness of their involvement in the program. For more information on how to participate, contact Matt Pennon at 805-698-2703 or [email protected] or visit http://ourcountyourkids.org/. About Our County. Our Kids. Our County. Our Kids. is a program of the Santa Barbara County Department of Social Services (SBC DSS). It is the SBC DSS resource family recruitment, retention, and support program. Visit www.ourcountyourkids.org/ for more information. 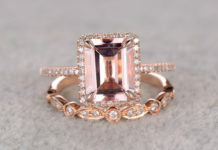 Why Choosing a Rose Gold Morganite Engagement Rings?